In large skillet, heat 1 tsp of the oil over medium-high heat. Add tortilla strips; cook 6 to 8 minutes, stirring frequently, until crisp and golden brown. Remove from skillet; set aside. To same skillet, add remaining 1 tsp oil and the chicken; cook and stir over medium-high heat until chicken is no longer pink in centre. Stir in taco seasoning and water; cook 2 to 4 minutes, stirring frequently. Meanwhile, in large bowl, gently toss salad greens, tomato, onion, beans and dressing. Spoon salad mixture onto individual serving plates. 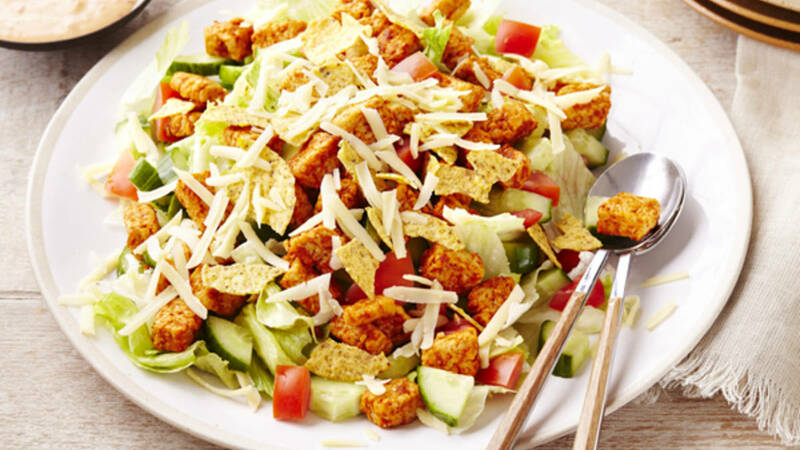 Arrange chicken over salad; sprinkle with cheese and tortilla strips. Serve with salsa.